Arguably the best turntable setup record on the market, the HFN test LP has sold over 10,000 copies since 1996. In 2002 Len Gregory aka the cartridge man decided to update the original release and returned to the Exchange studio for a new recording session. The album was re-cut along with a new frequency sweep test and improved pink noise tracks and dubbed 'The Producers Cut'. Packaging has been improved throughout with smart new graphics on the outer cover and a higher quality inner sleeve. Even the insert containing articles by John Crabbe has been reprinted on heavy-weight paper. 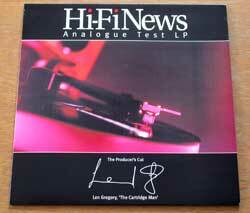 Sleeve notes remain largely unchanged except for the addition of an advert for a subscription to Hi-Fi news! 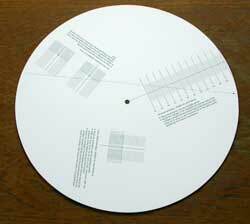 One of the nicest additions is the new alignment protractor, a glossy card disc 12" in diameter containing 3 different alignment techniques, all accurately reproduced. Standard Baerwald 2-point method suitable for 9" arms similar to the basic protractor included with the original issue. 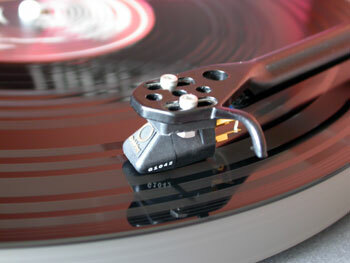 Linear Offset technique where a base line is aligned with the vertical bearing of the tonearm and the cartridge is aligned at a single point. Once you've aligned your cartridge with one of the protractors you are ready to run through the tests. If you are unfamiliar with test records the first thing you will notice are the widely spaced locked grooves; each 'band' contains a different test and you have to cue them individually. Always had an uncomfortable feeling that your channels where wired the wrong way around? This will let you know. This track is to help determine if the polarity of the wiring in your system is correct. This is very important for bass response and imaging and the effect can be clearly heard and adjustments made if necessary. You may be suprised just how much this effects the sense of spaciousness and depth in a recording. Allows a 'subjective evaluation of your system' in which the sound should be smooth and seamless. Use for setting channel balance before getting to the Bias setting tracks. These tracks are for setting anti-skate. If the 300Hz test tone is heard distorting or buzzing on either channel then your 'anti-skate' or 'bias compensation' should be adjusted to compensate. Most cartridges seem to sail through the first track regardless, but fine tuning will be needed to successfully complete the 14db and 16dB tracks. Increasing VTF towards the top end of the cartridge manufacturers scale can improve tracking here. It's interesting to note that advanced stylus profiles like the Gyger S on the Goldring 1042 have a smaller 'sweet spot' during bias adjustment . A Goldring 1006 and Audio Technica AT110E where equally indifferent to bias setting over a larger range of the scale and where unable to track the final band as well the 1042. The famous torture track - just another 2dB rise over band 8 but this is very difficult for a cartridge to track cleanly. If you've got through this far with reasonable results then consider this a test of your cartridges suspension design and tonearm control. Three identical tracks to test the consistency of arm performance across the record. Use these to check the final setting of your anti-skate and tracking force and then readjust if necessary so that all three track evenly with no distortion. Experience has shown that correct operation here assures good 'real world' results with 99% of recordings. These give a visual indication of the resonant frequency of your arm / cartridge combination. When the cartridge suspension becomes excited there is an obvious 'wobble' of the stylus and the pilot tone warbles. You are aiming for a reading of 8-15Hz and applying tonearm damping can help here if your cartridge is a mismatch for the arm. This track is designed for cartridge Azimuth adjustment. To check the stylus is absolutely vertical, play the track in stereo and you should get identical output from each speaker, but when the amplifier is switched to mono you will hear nothing. Unmodulated grooves which when played at normal listening levels will pick up any noise in your system such as rumbling bearings or poor plinth design. This was absolutely silent on both my sprung chassis Systemdek and Obsidian plinthed SP10 (bar the odd click and pop) so no problem there. As a satisfied user of the original HFN test record I was looking forward to the release of the latest version and wasn't disappointed. The new protractor is a joy to use, and while the tests are pretty much as before, the pressing I received is of a much higher quality with lower background noise than previously. Highly recommended.